In order to freely rotate, a ball bearing must have a certain amount of internal freedom of movement (Internal Clearance, or the space between the raceway and ball). Without this internal clearance, the bearing can be difficult to rotate or may even freeze-up and be impossible to rotate. 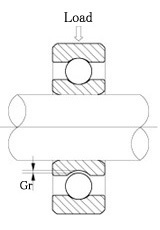 On the other hand, too much internal clearance will result in an unstable bearing that may generate excessive noise or allow the shaft to wobble. 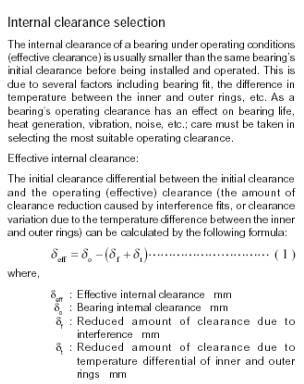 The internal clearance is measured in terms of the direction of the load (Radial Internal Clearance and Axial Internal Clearance). In our country radial clearance of the bearings known as 'dug' or 'play' and certain class of people do not prefer to use the bearings having radial clearance. But for most of the application radial clearance is a must. This statement is supported by the following arguments. Infact, redial clearance in the bearing is an important factor. The example shows a radial ball bearing, so the radial internal clearance is measured. The bearing is grasped at one point on the inner ring and at another point on the outer ring, directly opposite (see large arrows). The bearing is held together to assure radial contact between the inner raceway, balls, and outer raceway. This allows measurement of the bearing’s internal clearance at a point on the opposite side of the bearing--180°-- from where the points of contact are being made. 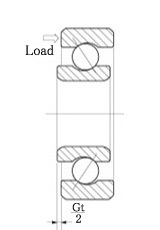 The small gap between the top ball and the raceway represents the bearing’s radial internal clearance. 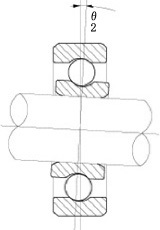 There is a designation system for indicating the radial clearance of bearings. Following designation indicates the magnitudes and clearance.